Bellows Beach is actually on the Bellows Air Force Station but is open to the public on weekends. There is a nice sandy beach and some picnic facilities. 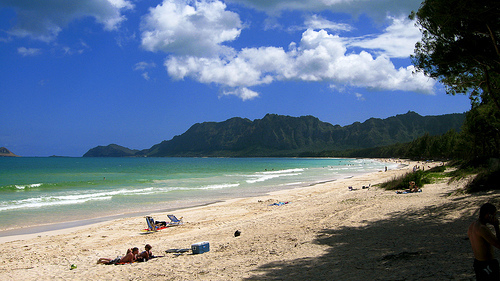 Bellows Field Beach Park is one of the more popular ocean recreation areas on Oahu. Watch out for jellyfish on the beach. They are tiny and look like sea-foam but stink like a bee. [PORTUGUESE MAN-OF-WAR] During the Summer it can get crowded with swimmers, beginning surfers, body surfers and campers. It has shallow waters and a small consistent shore break. Surfing is not allowed in the area between the two lifeguard towers. This beach is a great place to practice surfing and body boarding, just stay out of the swimming area. 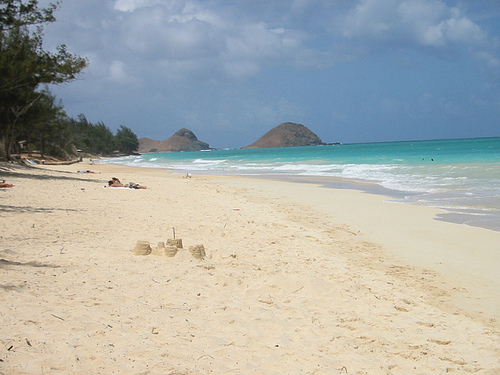 Bellows Beach OCEAN INFORMATION — For a detailed description of the Pacific Ocean’s marine climate, water properties, currents, tides, waves, etc., please visit The Ocean Atlas of Hawaii online. You’ll learn many interesting facts, like our average surface water temperature in Winter is 75 F (24 C) and 81 F (27 C)in the Summer.Call 596-SURF (that’s 596-7873) to hear a recorded message on conditions at various O`ahu beaches. The recording is a free service of the Surf News Network (SNN) and is updated four times a day, 365 days a year, at 7 a.m., noon, 3 p.m. and 7 p.m. In addition to wave heights, SNN provides information on winds, tides, and buoy readings.